Chris, an avid game hunter here in South Carolina, contacted us to purchase his entire collection. He shared many stories with us on how he acquired these animals, which was entertaining in itself. He has moved on to a new love of scuba diving and wanted to finance the new hobby. So we bought it all, you see it below. In our business, "you never know what's next"
Measures 57” long x 17” across back. Head measures from tip of nose to back of ear 15”. 49” tall overall on base. Base is 12” tall at the front foot, 8” tall at the back foot. Upper R 1-3/4"; Upper L 1-1/2"
For 200 years, hogs were brought to South Carolina by early settlers and eventually escaped adding to the wild population. In the 1930′s Russian Boar were introduced in to the wild of South Carolina so today, most hogs have a Russian Boar influence. Today it is estimated that South Carolina has well over 100,000 hogs running wild. Horns measure: Right: 12-1/2"; Left 12"
We understand it is listed in Boone & Crockett's, hunter: Dr. Snow, Jacksonville Florida. Hole in upper back of wooden backboard for mounting on wall. Base front of ear to nose: 23"
This should be a promo ad for the Chrysler Town & Country stow-and-go van, the moose head fit (barely), even with the 2nd row seats still up! Also called Jacobs Sheep, previously called piebald sheep, a rare, primitive species of multi-horned sheep with ancestry of 3,000 years. 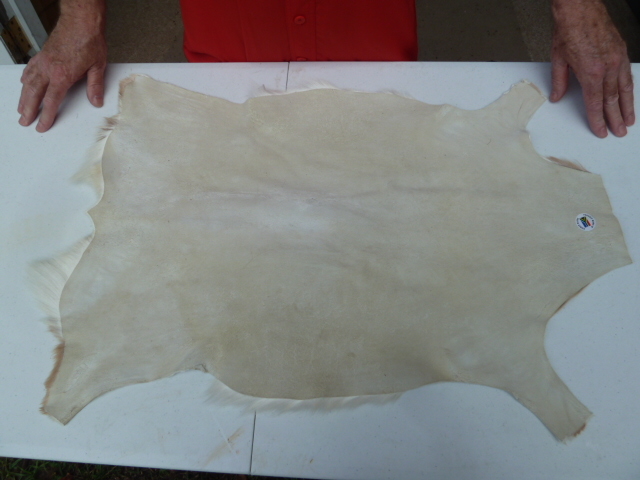 Extremely thick wool with rich coloring of white, tan, and chestnut brown. Wild set of horns on this interesting animal. 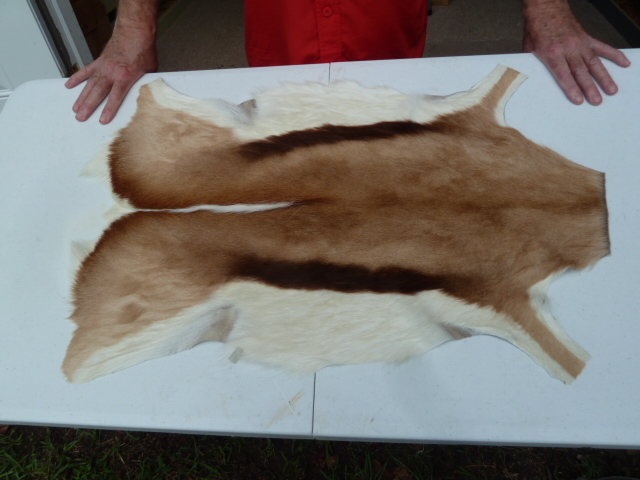 TOP: right 18"; left 12-1/2"
BOTTOM: right 14", left 9"
Taken in North Carolina at Goldmine Hunting, an Exotic Ranch. Chris won Silver Medal, documented; Chris indicated it would have been gold medal if the one horn had not been damaged (damage occurred naturally). HORNS MEASURE: Right 24", Left 20"
MEASURES 21-1/2" from wall, x 9-1/2" wide x 11" tall; approx 10 lbs. Chris tells the story that on the gator hunt, he shot this gator once from the boat, he thought it was dead as it sank, then he was standing at the edge of the bank when it came out of the water at him. He backed up, fell down, it came right up on his body and bit his arm before he shot it dead. When asked why he didn't shoot sooner, Chris said he didn't want to ruin his new gun. Weighs 2.2 oz. EXCELLENT condition, vintage 1950's. These were made in the 1950's and now the small Caiman's are protected. CROSS between a domestic goat and a Mexican Ibex, common in the Texas game ranches. Horns length: Right: 21"; Left 20"
Hide acquired in Namibia, Africa; taken by Chris' friend in 2012. 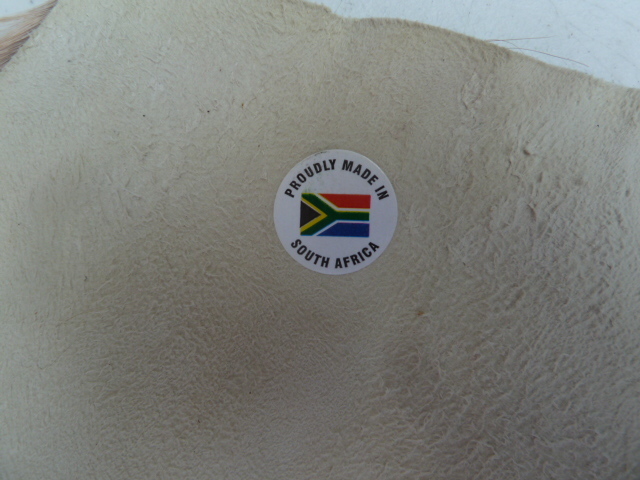 MEASURES 28-1/2" long x 18" wide; South Africa authentication sticker on reverse. Beautiful ridge of fur down the center. Excellent condition & color of hide. MEASURES 29" nose to tip of tail; 8" from wall x 10" tall; species described as Sand but not definitive. Teeth look like Spottail shark.